Sir George Alleyne currently serves as United Nations Secretary-General's Special Envoy for HIV/AIDS in the Caribbean region. He was appointed to the position by UN Secretary-General Kofi Annan in February 2003. Alleyne studied medicine at the University of the West Indies (UWI) and graduated as the gold medallist in 1957. Subsequently, he pursued his postgraduate training in internal medicine in the United Kingdom and the United States. In 1972, he became Professor of Medicine at the UWI. In 1976, he was appointed Chairman of the Department of Medicine. In October 2003 George Alleyne was appointed the Chancellor of the University of West Indies. Besides his academic experience, Alleyne also gained much experience in working for international organizations. In February 1995, he became Director of the Pan American Health Organization (PAHO), Regional Office of the World Health Organization (WHO). 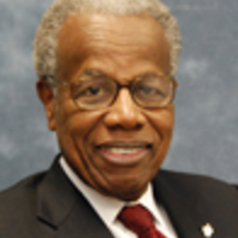 He served two four-year terms in this position until the end of 2002 and was elected Director Emeritus. As Special Envoy for HIV/AIDS in the Caribbean region, he is responsible for ensuring follow-up to the United Nations General Assembly special session on HIV/AIDS and the Pan-Caribbean Partnership against HIV/AIDS, in the Caribbean region. Occasionally, he also represents the UN Secretary-General at events related to HIV/AIDS in the Caribbean region. He was made Knight Bachelor by Queen Elizabeth II in 1990, and awarded the Order of the Caribbean Community in 2001. In October 2008 Alleyne received the Science of Peace Award from the Inter American Heart Foundation.